When natural teeth are lost, your health, your self-confidence, and your personal goals can all be negatively impacted. 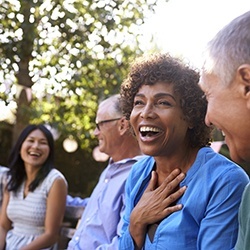 Dr. Monica Boehmer understands the importance of a complete smile, and her top recommendation for lasting, high-quality replacement is a dental implant. Implants are designed to function in a seamless fashion when compared to natural teeth, and our team will coordinate every step of your reconstructive transformation for optimal convenience and comfort, paying close attention to even the smallest details. To schedule an implant consultation, contact our Albuquerque, NM practice today. 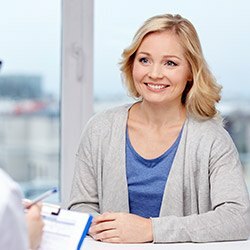 Dental implants are wholeheartedly unique because they start by replacing the root of the natural tooth, not the white crown on top that we’re all so familiar with. 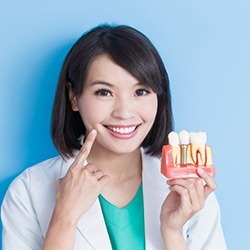 With a new, functioning tooth root in place, the jawbone is successfully stimulated and the threat of deterioration (a common fear following long-term tooth loss) is minimized. This state-of-the-art technique also establishes a strong foundation for the eventual implant-retained crown or similar restoration, helping it function at a very high level that’s practically on par with the original. The aesthetics of the new tooth are also excellent. One of the biggest benefits of choosing dental implants is their longevity. They are designed to last for decades at a time, and many patients are able to maintain their brand-new teeth for the rest of their life. All in all, they have a general success rate of over 90%! The custom, lifelike restorations Dr. Boehmer designs for your dental implants will depend on a few different factors, including how many natural teeth need to be replenished and where they’re actually located within the mouth. For singular implants, an all-ceramic dental crown provides the ideal coverage. This new “tooth” will fit right into place alongside the rest of your natural smile, and our team won’t have to reduce the natural, healthy structure of surrounding teeth to accommodate its placement, which would be the case with a traditional bridge. Planning for the replacement of multiple teeth/implants will depend on their location throughout the mouth. Implant-retained crowns can be used to cover multiple implants in different locations, but a more comprehensive option is an implant-retained bridge. If teeth have been lost that once appeared consecutively along the same arch, two dental implants can be anchored on either side of the gap to support this sturdy prosthetic and help it fill the space. Implant-retained dentures are a reliable and cost-effective reconstructive option for patients who’ve lost a great deal of natural teeth. Instead of having to place one dental implant for each missing tooth, a smaller number of posts can be surgically angled within the jawbone to support an entire prosthetic instead. Your new denture can be either be permanently fixed in place or left removable in nature if you’ve already spent years becoming well-accustomed to traditional dentures. Dr. Boehmer strongly believes that her patients deserve the highest levels of quality possible as they transform their smiles and their health with state-of-the-art dental implants. That’s why she partners with true surgical experts for the initial implantation into the jawbone before personally handling the design and creation of the final restoration. 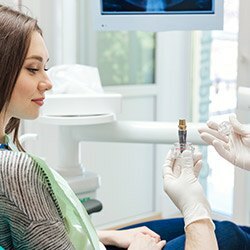 With each dentist focusing on their strengths, patients can achieve confident, lasting success and a newly recompleted smile that stands the test of time. 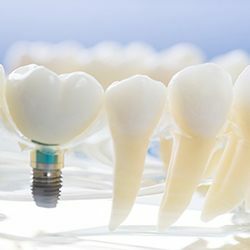 Dental implants are a multi-step procedure that involves the placement of one or more titanium posts, the connection of an abutment, and then the final addition of a customized restoration (crown, bridge, denture, etc). Each of these components will incur their own cost, and no two treatment plans are exactly the same. That’s why your first step should be scheduling a dedicated implant consultation with Dr. Boehmer. She can assess your oral health, listen to your personal goals, and provide confident price estimates before any actual treatment begins. 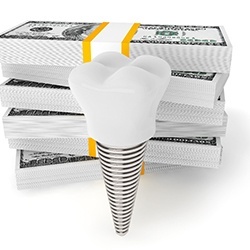 Dental implants may seem like an investment at first glance, but we know that you’ll be more than satisfied with the lifelong benefits.